So, if you've looked at any of my recipes throughout this blog you'll notice I've gone with the Lazy Mom mindset in the past. But I kind of got tired of that, I mean, what mom IS actually LAZY? Not me. Seriously, not me. And I know not you, either. So why do that? Why call myself, or any of us, that? I'm not quite the Pinteresting mom, but I can cook up a mean meal of something or other when I set my mind to it, ya know? And my pictures might not be perfect - honestly - most of my food posts in the past don't even HAVE pictures. I'm from the pre-Pinterest era and all. But the food tastes good. It's easy to make. And yum. And my kiddo, my husband, myself, at least one of us has enjoyed it so it's gotta be worth recommending, right? Stay with me, I promise the recipe will be here soon. Last night I got inspired by the amount of extra bread we had on-hand and decided to prep a French Toast Casserole for this morning's breakfast. I'm not really THAT mom. I'm not prepared and usually my kid is having cold cereal or pop tarts. No capital letters, I tend to opt for generic. Money-saver that I am. Or try to be. But this is a really easy recipe. You probably have everything in your house right now. And if you're not sure? Look at it. Don't you want to try it now? Find yourself a 9x13 baking pan. I prefer my Pyrex because it's become the go-to baker for me. You could use a Corningware, but mine are all oval or round, and so that doesn't quite work. Here's the step-by-step for you. * Stir sugar/cinnamon mix into baking dish and whisk through the butter. It will seem weird and stuck together, but as long as you work to get it fairly even across the entire dish you'll be fine. And I use the word "work" really lightly here. * This is where the first optional splash of vanilla extract comes in. A drop goes a long way, so just mixing that in with the butter-cinnamon-sugar at the bottom of the baking dish will give you a little extra flavor. * Layer 6 slices of bread in the dish. Layer the second 6 slices on top of those. Optional to splash some of the cinnamon/sugar mixture in between the bread slices. * Mix 6 eggs (or 5 if you only have 5!) and 1-1/2 c milk in a bowl. Pour mixture over bread evenly. 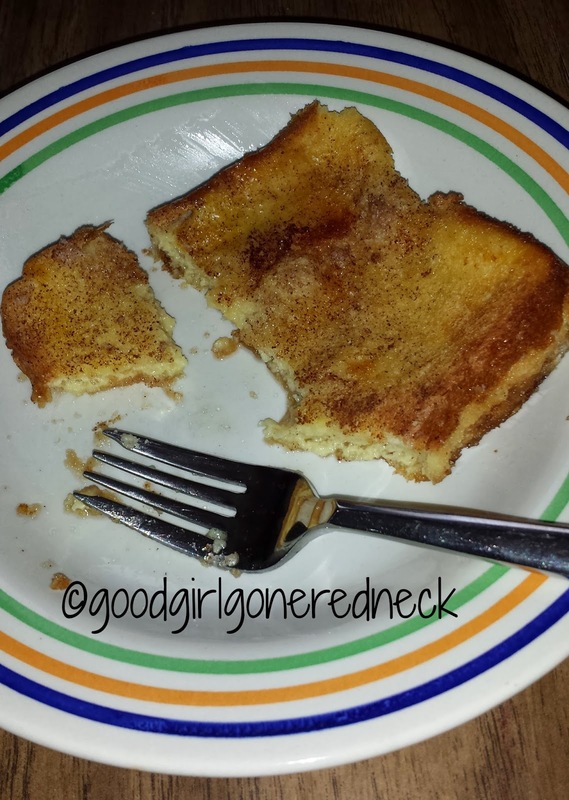 * Second optional splash of vanilla extract here if you want the vanilla flavor to soak into the bread some. * Splash more of cinnamon/sugar mix on top. * Cover baking dish (if you're lucky, like me, you'll actually have the right cover for the dish! If not, foil works fine. Refrigerate overnight. * Preheat oven to 350*. Bake for approximately 40-42 minutes. 45 if you want the top a darker brown. I know, it looks exactly the same, really. Just more golden. But it tastes really good. I promise. Like we could surely eat the entire thing in one sitting good. Not ME. But the three of us. And yet we put the rest of it away for tomorrow's breakfast. Like, keep your hands off so mommy can take a picture for Instagram good! You could consider this to be a 3-serving meal, if you each eat two "squares" - but it's pretty rich and flavorful, and quite sugary, so if you serve some fruit or a side of something with it it should feed more than three people. It's certainly not "diet-friendly" - but sometimes we don't care about that, right? I mean, you could mess around with it and probably make it healthier, but why mess with a good thing? Oh! You certainly don't need syrup or extra butter when serving, so that helps, if you really are worried. Honestly, this is usually just a Christmas breakfast sort of thing in our house. I just got motivated and found myself with extra bread that I didn't want to turn and didn't have room to freeze. 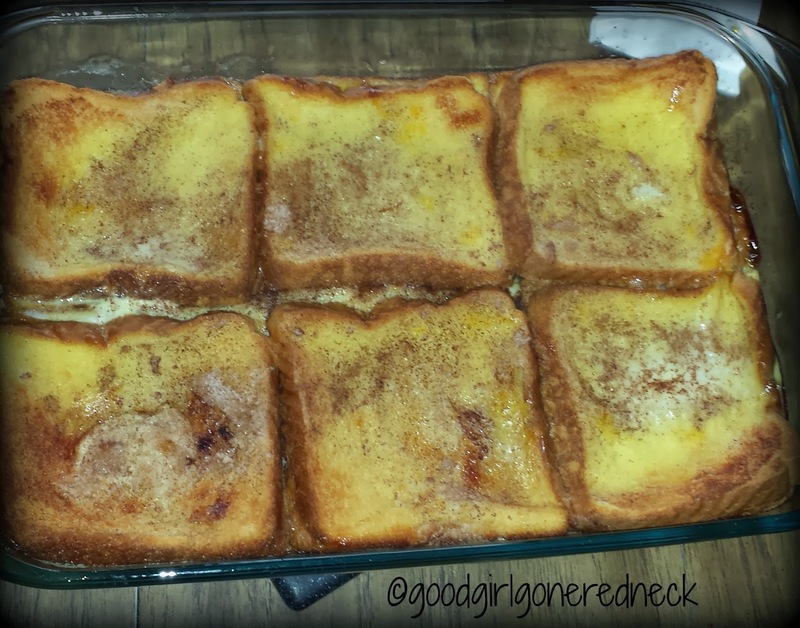 And so - there you have it - French Toast Casserole for a regular ole' weekend breakfast! Enjoy! Oh I need to give this a try! My son has an egg allergy, but he can now eat food with egg that has been cooked. 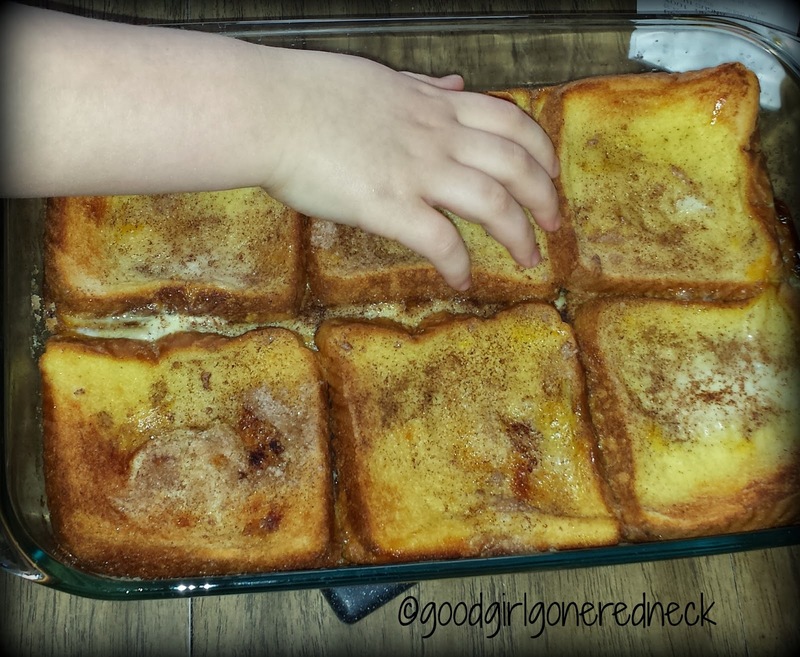 Usually French Toast isn't cooked enough, but with the baking required with this he could actually eat it! I've seen that on pinterest and thought that it looked like a bad soggy idea. Guess I was wrong! That sounds and looks amazing. Thank you for sharing..
Hahaha! I love you. Pre-Pinterest era is definitely interesting. I have been culling through old posts on OPC for the new home I am working on, and 90% of the posts are pictureless. I think I will make this tonight for tomorrow. The kids will love it. I make something like this and we love it. It's so interesting to see someone else's take on a similar dish. I'm going to try it your way next time! Hi! I made this last night - it goes together super fast. I substituted coconut milk for the regular milk.